These and other similarities nurture the suspicion that the two plants may not be as unrelated as suggested by the absence of tracheid wall thickenings in Aglaophyton . So it will be interesting to look for more evidence supporting one or the other view. Photograph: Aglaophyton cross section with unique "fairy ring" resembling the array of protoxylem in the xylem strand of a vascular plant. Note also the incidentally cut stoma on the right. Unexpectedly, one small sample of chert with uncommonly well preserved Aglaophyton axes has provided a rare sight as shown here: The "fairy ring" of distinct white spots can hardly be regarded as incidental although it is seen in this regularity on only one section. On other sections, the spots, if there are any, do not form a complete ring or are more irregularly distributed. As a possible explanation, some slight chemical difference between cell types, inherent or due to differential stages of decay, led to different mineralisation resulting in strong optical contrast. (Slightly differing starting conditions leading to vastly differing final stages via complex processes is not uncommon.) The white spots are brought about by strong reflection, probably due to fine-grained quartz, contrasting to the more or less transparent chalcedony. In the particular case seen in Fig.1 the situation seems to have been so subtly balanced that only a certain type of cells has been affected by the contrast-enhancing process. 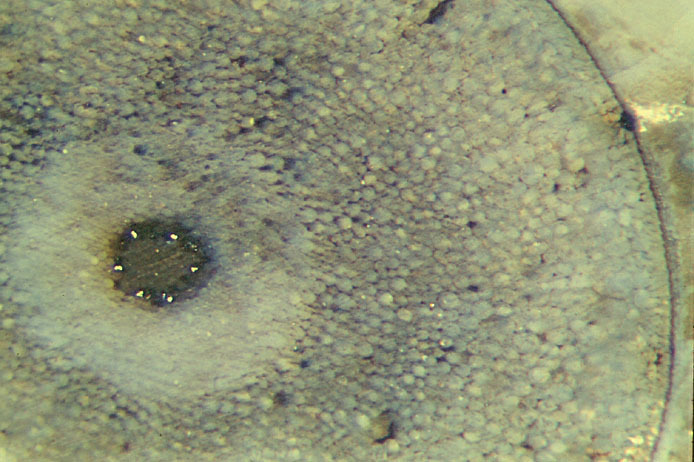 Comparison with the well-known arrangement of tissues in other simple vascular plants suggests that this central strand is made up of xylem with 6 spots of protoxylem. This interpretation may provide additional evidence in favour of the assumption that Aglaophyton does not as much differ from a vascular plant as assumed in  but is simply an unusual vascular plant without the usual tracheid wall pattern.